The Bermuda Football Association announced that the senior men’s national team will begin preparation for the NatWest Island Games to be held in Bermuda, July 13-19, 2013. 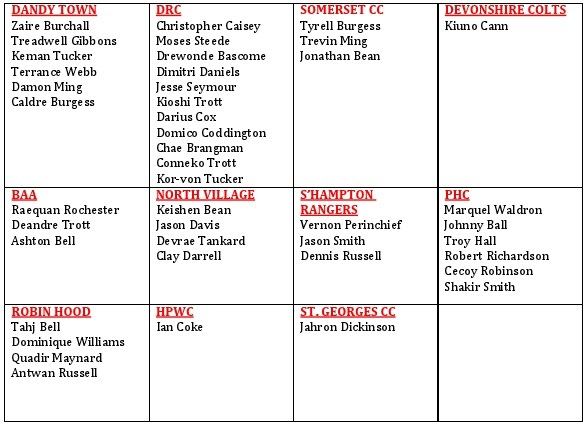 The coaching staff, headed by Andrew Bascome and Dennis Brown, has identified an initial list of local based players that they would like to evaluate for possible inclusion into the player pool for training. Trial matches will take place 6:45pm on Wednesday nights at the BFA Field on January 16th, 23rd and 30th. The coaching staff reserves the right to invite additional players into the training pool following the conclusion of these trial matches. Overseas based players in schools and academies have also not been included in this list but will be factored into consideration during the next phase of assessments to occur upon conclusion of their studies and return to the island. Players are asked to arrive at the BFA field by 6:00 PM to prepare for a 6:45 PM kickoff. Any player unavailable to play is asked to please send notification to the BFA via rtodd@bermudafootball.com . First to congraulate all those chosen, second I am a keen follower of the local game for sometime. With that said I am confused as to why the gentelmen Mallory (scc) has never been involved…it could be personall reason but we got to find a way to get our best players on the field,and he for sometime has been wonderful a real leader on the field..watever it is we gotta try get ppl like this young men involved…nevertheless pleased with the new look! !